Cool roofs keep buildings cooler by preventing heat transfer to the inside of the building by either reflecting the sun's heat or emitting what heat the roof may absorb. Cool roofs lower energy costs by decreasing the load on HVAC systems. Typically light in color, cool roofs come in a variety of materials. Pioneer has an industry leading 30-year track record of installing, maintaining and servicing cool roofs. The Cool Roof Rating Council (CRRC) maintains a rating system for different types of roofs. Pioneer partners with American Solar to install their patented metal roofing systems which deliver high performance solar heating in beautiful weather-tight roofs that are indistinguishable from conventional roofing systems. American Solar's metal panel systems become the weather-tight building roof. 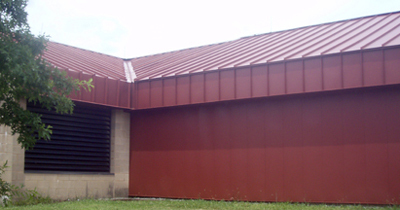 The system's components are conventional metal roofing panels, shingles, shakes or slates. This unique approach to solar heating delivers large solar heating systems with high energy savings. The sun is the most effective and cheapest method to light your building. Sunlight also improves productivity. With energy costs rising and companies trying to reduce their carbon footprint, all types of building owners are looking toward the sun. A new skylight or sun tube will brighten up a room and by combining it with an auto-sensing light that adjusts to the sunlight in the room your electric bill could be dramatically reduced. Pioneer's expert installers meticulously flash all new skylights and sun tubes so light is the only thing that gets into your building. Increasing the R-value of the insulation can reap big rewards over the life of your roof system. An additional layer of insulation helps offset rising energy costs, can prevent a thermal break and provides a great return on investment. Pioneer helps it clients achieve their goals by weighing insulation costs against potential energy savings. Changing your roofs color to white can make it much more energy efficient. 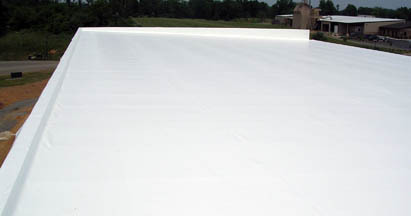 White roof coatings can drastically lower the temperature of the roof surface during the summer. By reflecting the sun's rays, rather than absorbing them like a traditional black roof, your building stays cooler and that reduces the load on your HVAC units, saving you money on your electric bill. Let Pioneer help you maximize the number of LEED (Leadership in Energy and Environmental Design) credits as defined by the US Green Building Council. Green/vegetative, cool or solar roofs help make those credits add up. We understand the additional paperwork and know how to keep material travel distance low as well as handling on-site recycling during the job to make sure your project goes smoothly. Whether it's the gold, silver or platinum certification that you are working towards, Pioneer Roofing will help you attain your goal. LEED provides a rating system for green building products and design that foster sustainable development. These products meet current needs without causing future generations problems in meeting their own. By choosing LEED certified products a building owner amasses credits that may add up to a gold, silver or platinum rating. Reflective roof membranes and coatings qualify for LEED credit. Depending on recycled content, some products used in roof construction such as wood, fiberboard, ISO and EPS may qualify for additional LEED credits. Also, installing insulation that exceeds the value required by code can garner LEED credit. In some cases using products manufactured within 500 miles of a job location can be considered for LEED credit. To obtain the distinction of LEED Certified, project documentation must be submitted to the LEED Steering Committee for verification. Twenty-six minimum LEED verified credits are required to be awarded certification for new construction and 39 LEED credits for existing buildings. There are numerous government and power company programs, rebates and incentives to make choosing sustainable products financially attractive to designers and building owners.